As part of my complete chimney sweep Cambridge based service I can undertake a CCTV inspection of your chimney or liner. I use a professional, compact and highly portable camera system with full recording and playback capabilities for use in chimneys ducts and pipes which is purpose built for the chimney professional and designed and manufactured in the United Kingdom. With ‘live’ recording direct onto SD card via digital video recorder built into the lid of the carry case. This enables me to show my customer exactly what the issue is. I can also provide my customers with a copy of the video or more normally still images as required. To the right is an example of the quality of the still images produced and a short video. A Modern Chimney Less than 12 Years Old. 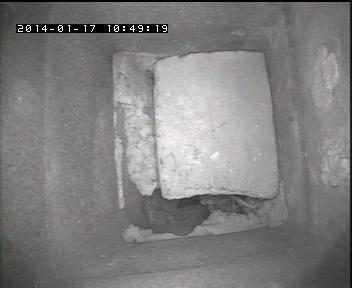 This image, looking up the chimney, shows a piece of masonry blocking a chimney flue. The customer is now able to take the matter up with the builders at their expense. This image is of a metal grill which had been built into the chimney some years ago and now has a bird nest on it. Allegedly the flue was swept every year. Impossible. 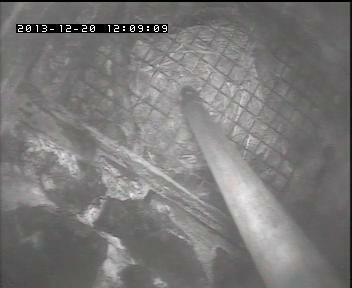 The Rod in the centre is where a previous sweep had got his rods stuck in the wire mesh. The customer is now able to have the necessary building work carried out to remove the wire mesh and then call me back to sweep the chimney properly.